The Trump administration early Tuesday released its highly anticipated proposed rule to expand the availability of short-term, limited-duration health insurance plans as a way to increase affordable coverage options. The proposal would allow consumers to buy short-term insurance plans that last up to 12 months, compared to a maximum of less than three months under current law. The plans would not be subject to certain Affordable Care Act rules, including requirements that insurance plans must cover 10 essential health benefits and pre-existing conditions without annual or lifetime limits. 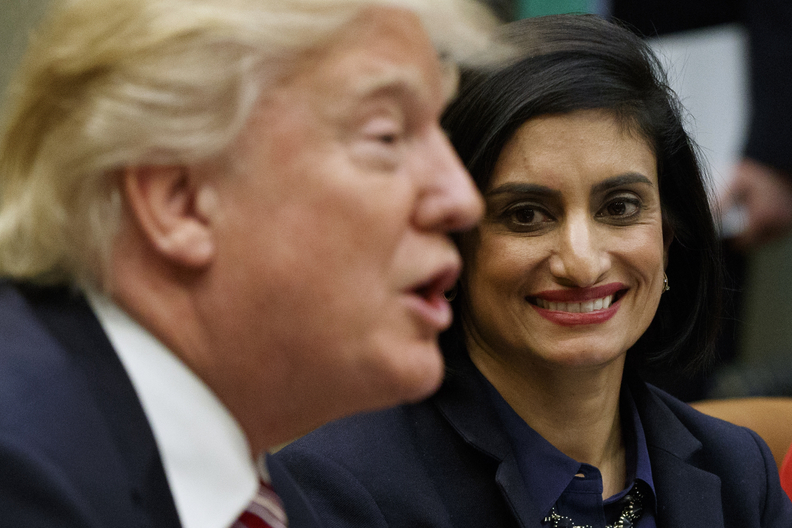 "Today's announcement is about giving Americans who have been priced out of the market new, more affordable coverage options and allowing them, not the government, to make decisions about what works best for them and their families," CMS Administrator Seema Verma said in a press conference Tuesday morning. "While in the past these plans have been a bridge, now they could be a lifeline." The proposal targets relatively healthy people who are not currently eligible for federal premium subsidies available through the exchanges. Verma said the plans are meant for those individuals who cannot afford Obamacare policies, are between jobs, or whose preferred doctors aren't covered by the narrow network plans on the exchanges. Critics argue that opening up access to short-term plans could destabilize the individual insurance market and cause premiums to rise by siphoning away healthy people, leaving insurers to cover only the sickest, costliest members.Some say that the plans are nothing but "junk insurance" that put vulnerable consumers at risk for costly medical bills. "This new rule demonstrates this administration's intent to replace comprehensive coverage for individuals and their families with plans so unreliable they cannot rightly be considered health insurance," Frederick Isasi, executive director of consumer advocacy group Families USA, said in a statement. But some cheered the proposal and hoped HHS would go further by allowing short-term plans to extend beyond one year. "Obamacare health insurance plans are unaffordable for many Americans, so the administration's proposed rule provides much-needed relief," Doug Badger, a visiting fellow at the conservative Heritage Foundation and a senior fellow at Galen Institute, said in a statement. "The Health and Human Services Department should go further and allow consumers and insurers to renew these policies as well as purchase them." With the proposal, the HHS said it is targeting the nearly 28 million people who are uninsured. "There are healthy people who are sitting on the sidelines without coverage and this is an opportunity to provide them an opportunity for coverage whereas right now they might not have that," Verma said. Still, the agency expects between 100,000 and 200,000 people who are currently insured in the ACA exchanges to switch to the short-term policies in 2019. It did not have an estimate on how many of the now uninsured would select this coverage option. Verma said the shift toward short-term plans would have virtually no impact on individual market premiums. However, the proposed rule states that the shift of members to short-term plans in 2019 would cause average monthly individual premiums to increase along with the average monthly premium tax credit available to exchange members with incomes up to 400% of the federal poverty level. That would lead to an increase in total annual advance payments of the premium tax credits of between $96 million and $168 million. Moreover, individual market insurers left with a sicker risk pool could incur financial losses and choose to exit the market, further reducing choice for consumers, according to the proposal. During a roundtable discussion with reporters on Tuesday, HHS Secretary Alex Azar insisted the new policy was more about furthering access to affordable coverage rather than any attempt to destabilize the individual market. Late last year, the CMS estimated there were 1,565 counties that have one carrier. In other words, more than 2 million people on exchanges don't have more than one insurance carrier option. Azar said the rulemaking could be key to getting so-called young invincibles covered, which was something the agency has had trouble doing. "This is why we were struggling with the younger, healthier people, because if they did not qualify for subsidized coverage, the options on the market could be unaffordable," Azar said. He acknowledged, though, that the plans are not for everybody. "We need to be transparent about for whom this makes sense and for those it doesn't," Azar said. The proposed rule states that while short-term plans may offer some people more choice at a lower cost, others who switch from ACA-compliant plans may have reduced access to some services and providers, and increased out-of-pocket costs that could lead to financial hardship. Insurance companies would be required to prominently display in the contract and application materials that the policy is exempt from requiring some ACA protections. "These plans can be effective stopgaps. But they are not functional as full-time health coverage products, and it would be a shame for consumers to find out the hard way should this proposed regulation go into effect," said Margaret Murray, CEO of the Association for Community Affiliated Plans, which represents not-for-profit safety health plans. The proposal reverses the Obama administration's move to limit short-term plans. That administration in 2016 reduced to plans' maximum duration from a year to three months. Under the ACA, the plans are not considered minimum essential coverage, so individuals who enrolled in them in the past would have had to pay a financial penalty. The Trump administration last year zeroed out the individual mandate penalty starting in 2019, so people who enroll in short-term plans next year would not be penalized. HHS will accept comments on the proposal through April 23. It is asking for input on whether the length should be some other duration, and whether the plans should be guaranteed renewable and how that might work. The proposal comes in response to President Donald Trump's Oct. 12 executive order directing federal agencies to propose ways to expand access to short-term plans. Several major health insurers, including UnitedHealth Group and Aetna, have said they are ready to capitalize on the president's order. HHS' proposed rule points out that insurance companies will likely experience higher premium revenue and profits from the expansion of short-term plans, which will not be subject to ACA medical loss ratio requirements. The ACA requires insurance companies to spend at least 80% or 85% of premium dollars on medical care and quality-improvement activities. Aetna CEO Mark Bertolini told investors in October that the company is considering launching short-term plans that last a year, but aren't just skinny plans. "As soon as the executive order came out, we were on top of it," he said. Last month, Blue Cross and Blue Shield insurer Wellmark reportedly held a teleconference with Trump administration officials about the pending short-term plan rules, according to Axios. Virgil Dickson contributed to this story.